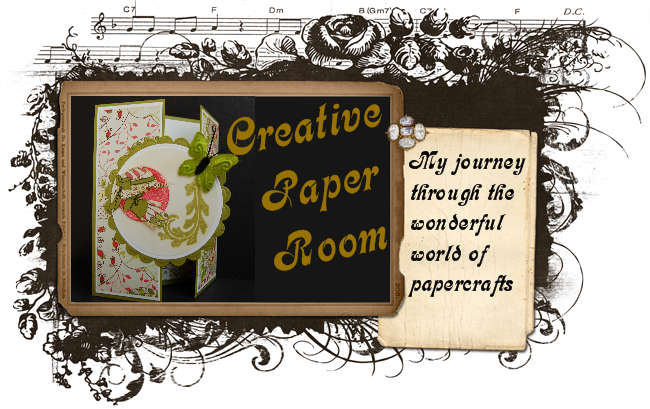 Creative Paper Room: Sprinkles On Top! Hi everyone, I'm still working on my Flourishes Birthday Bash cards. This challenge is called Sprinkles On Top! Pick your favorite embellishments and sprinkle them throughout your card. So mine is glitter and Stickles. My image is from the set Christmas Classic. I have a friend who is not very girlie and loves the outdoors. This is going to be a perfect card for her. Not to girlie but enough sprinkles to excite. My eb folder is Forest Branches, I coated the folder in Rich Coco Memento then embossed. I add white glue to the "branches" followed by white glitter(let dry) I used glossy accents on the berries and Cardinal, on the wing I added some stickles (let dry). I embossed a small piece of Kraft with Holly Leaves, added Chocolate glitter from PG Glitz on a piece of score tape. Topped it all off with a Spellbinders poinsettia embellished with a jeweled brad and white gel pen. I have one more to go and you still have 8 days to join the fun if you want. Beautiful card, Colleen! Love the bird and the gorgeous poinsettia! Love this one, especially the dies you used! I am working on mine, just need to get one posted, lol. Well hello, Mr. Cardinal! May we also say hello to all that yummy texture and that gorgeous flower? Wow! What a beautiful card! Love the embossing and how you accented the Forest Branches! Your cardinal is gorgeous and that poinsettia is the icing on top of the cake!! What a beautiful poinsettia flower to accent the bird! A great sprinkled-up Christmas card! Thanks for playing along with us at Flourishes! Beautiful Christmas card, the poinsettia looks awesome with the design and wonderful cardinal. Thanks for playing in Flourishes 2,4,6,8 Celebration!